With Thanksgiving being early this year, I had an extra week to prepare for Christmas. With the overconfidence of that extra week, I was totally unprepared for this last week before Christmas and gifts for my students. Without completely knowing what I was going to do with them, I purchased plain white t-shirts and went to You Tube for suggestions. I always try to tie in gifts with what we are doing in class and this year, of course, it is all about the Iditarod. 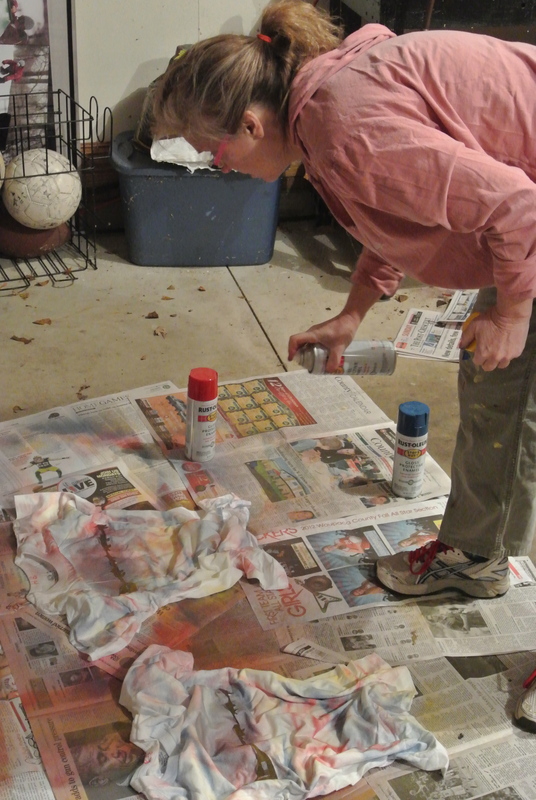 You Tube had lots of suggestions on creating colorful shirts with fabric paint or spray paint. I did my usual borrow and tweak, and came up with Aurora Borealis T-Shirts. I don’t have a formal lesson plan for this so I’ll just explain what I did. Students cut out the templates of the dog teams and used glue sticks to glue them onto their t-shirts. 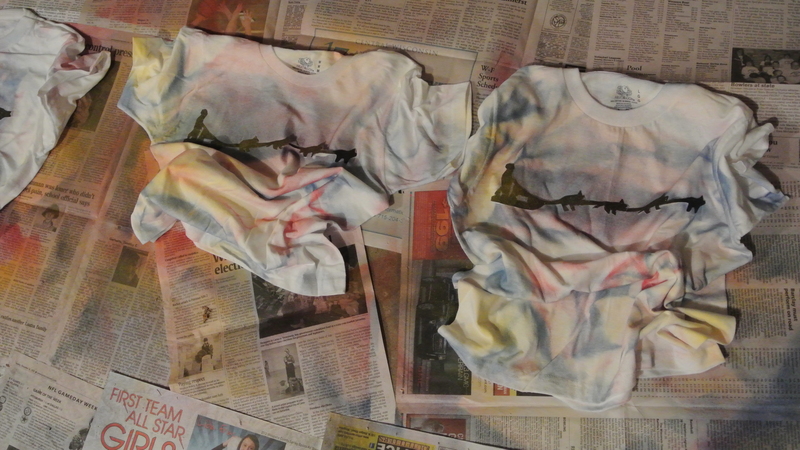 Using spray paint and a well ventilated garage I scrunched the shirts and sprayed with blue – re-scrunched and sprayed with red – I gave a final scrunch and sprayed them yellow. The template easily lifted off the shirts. Once dry, I put them in the washer and dryer. I love how they turned out! 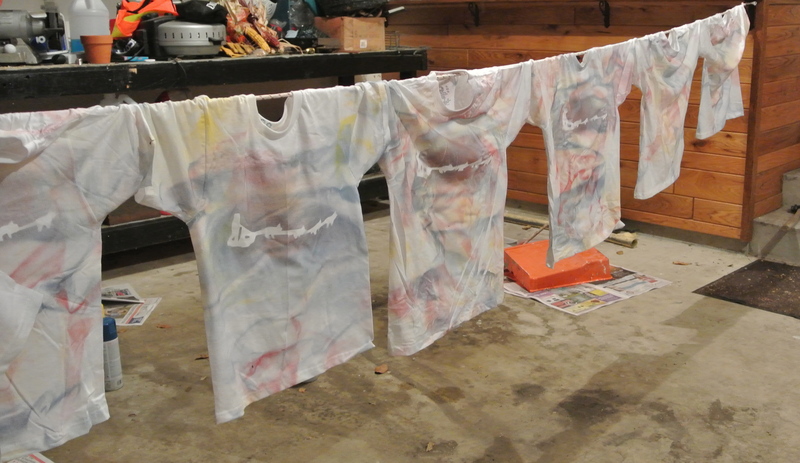 Students can also create t-shirts themselves using fabric paint. (I chose to use spray paint because it is less expensive and when I’ve tried to spray fabric paint in the past it has clogged.) Each student will have their own unique t-shirt to remind them of the Aurora Borealis and the Iditarod.